Attention! 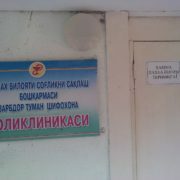 Help doctors and teachers to break free from slavery and tyranny of Khokim Davron Sultanov. Buka, Uzbekistan. 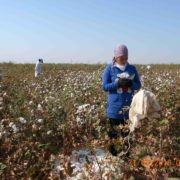 On September 16, 2016, the human rights activist Elena Urlayeva traveled to the Buka district of the Tashkent region after physicians and teachers had called for help to be saved from forced labor during the cotton harvest. Elena Urlaeva interviewed doctors that are working in Central Clinic of the Buka district and was informed that since September 13, 2016, doctors of this particular clinic were mobilized for 30 days to a remote area of the Buston district for cotton harvest. Their colleagues, the doctors F. Imomova and M. Mirsolieva supervised them. The doctors who refused to be mobilized for the cotton harvest had to pay 600 thousand Uzbekistani Som for hiring mercenary cotton growers. Also, doctors of the Central Hospital, of rural clinics and ambulancesand ambulances, as well as dentists were mobilized to pick cotton for a 30-day period. Elena Urlaeva went down to the cotton fields, where the health care sector employees have worked. 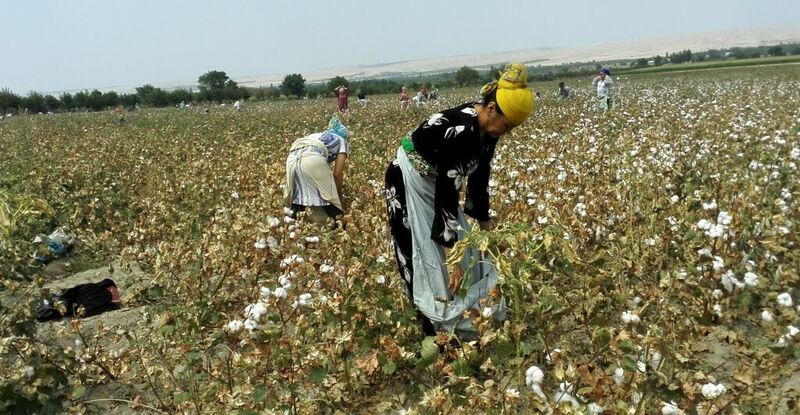 They are currently picking cotton in the area near the villages of “Buka” and “Kyrgyz aul” in the “Buston” district. There are food and sleeping areas as well as the district cotton headquarters. The doctors told us that they worked from 7am till 6 or 7pm. 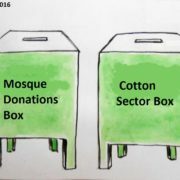 The daily quota for cotton is 70 kilograms per person. Food supplies are provided by the district Khokimiyat. The doctors sleep in private homes, in rooms at the headquarter building and the local school No. 42. Doctors are put together in units. For example, Unit #478 includes 240 doctors, including the staff of the Central Hospital and doctors from several clinics in the Buka district. 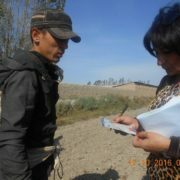 Usman Khaitov, chief of the unit, asked Elena Urlaeva to leave while she was talking to the doctors working in the cotton field. Usman Khaitov told Elena Urlaeva that only “makhalla” residents (locals) and hired cotton growers were picking cotton, which is apparently not true. Urlaeva saw a personal tent of Khokim Davron Sultanov approximately 70 meters away from the field. It was a big tarpaulin tent, with a trestle-bed and table inside, and separate table with a computer for processing information related to the cotton harvest. It is guarded day and night. A member of the cotton headquarters informed Urlaeva that Khokim Sultanov often came down to the headquarters to check the situation on the fields. He also said that it was strictly forbidden to mention that doctors were involved in the cotton picking. The doctors of Central Clinic work in the Unit #472. The chief of this group told Urlaeva that the unit consisted of hired workers only, which is also not true. Urlaeva had a chance to talk to teachers and methodists who said that they would go and pick cotton in the afternoons and on work-free days. As stated out above, they are forced to pick cotton, and the head of the District Department of Public Education M. Kushinbaev controls the process. The daily quota is 50 kg. Elena Urlaeva managed to enter the cotton headquarters of the Buka district Khokimiyat, which is located just behind the main building of the Khokimiyat. There are two large tents and tables on the territory of the headquarters. She could see beds and tables inside. Elena Urlaeva observed 20 men in camouflage uniforms and civilian clothes sitting at the table. There were also employees of the prosecutor’s office among others. Some of them were equipped with radio sets. One of the man in a camouflaged uniform told Urlaeva that they were processing reports on the cotton harvest coming from the district. Urlaeva saw a banner next to the Khokimiyat’s building. The banner contained information on the prohibition of forced labor, pictures of doctors and teachers, and the contact number 1092 for reporting cases of forced labor. 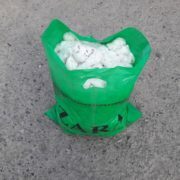 Based on the conversations with the cotton pickers, cotton cultivated in the Buka district is picked by doctors and teachers from the Kibray district. Employees of different companies located in the city of Angren are also involved in the cotton harvest. They live in the collective farms “Michurin”, “Guliston” and others. They are mobilized for 30-day terms. 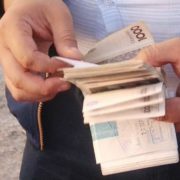 Upon arrival in Tashkent, Yelena Urlaeva informed the Uzbek Ministry of Internal Affairs, the National Security Service, the Uzbek Ministry of Health, and the Federation of Trade Unions of Uzbekistan about the cases of forced labor she had observed. She demanded to cease all criminal activities of the khokim in the Buka district, and to bring all exploited workers back to their workplaces. The interviews with the workers were recorded on tape by Ms. Urlaeva.